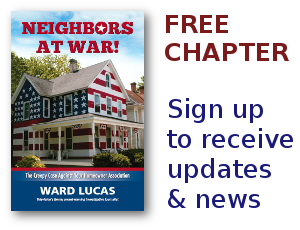 firearms Archives - Neighbors at War! The massive corruption involved with major over-charging of assessments and accumulating hidden slush funds from surplus assessments is still going on in Sun City Anthem, Henderson, NV with no end in sight. Neither the state nor the city leaders are willing to act to stop it. The facts are plainly documented–even this year with yet another board member who got it, and was ignored. Michael Crick of Bridal Trails HOA in Bellevue, Washington loves trees but not ones that are diseased or at risk for falling on his home and possibly killing his family. So, he obtained the proper permits and the city arborist determined the trees he marked for removal were correctly selected.